. . . Police said three gunmen entered the bar about 10:55 p.m. Tuesday — one of them shooting into the ceiling as they came in — and ordered everyone to the floor. Wade ran toward the former police officer and shot him in the thigh. The ex-officer, who worked for the department for several years in the 1970s and has a concealed-carry permit, fired back, shooting Wade in the eye and Davis in the shoulder, police said. Another male customer, 73, was shot in the ankle and was in critical condition; a fourth male victim, 66, was released from the hospital after receiving treatment for two shots to his buttocks. Davis and a third gunman, whose identity was unknown, fled in a stolen Mazda, investigators said. Police found the wounded Davis at a hospital; he claimed he had been shot at a different place. A manhunt continued for the third man. . . . .
Las Vegas police arrested a man after he allegedly tried to a rob a Red Lobster restaurant on Thursday night. A call was made to police around 9:45 p.m., reporting a man had entered the Red Lobster . . . near U.S. 95, with a handgun. The man, who has now been identified as 28-year-old Dillon Webb, allegedly threatened customers and employees and took the drawer from a cash register. Witnesses said the man ran out the back. A customer from the restaurant, attempting to flee the area, was confronted by the suspect in the parking lot. The customer, who was armed with a handgun fired one round. Webb reportedly dropped the drawer and ran. . . . Thanks for Tony Troglio for the first link. Admittedly the law is hilarious, though the consequences of it are rather sad. Newest piece at Fox News: "Ferguson: Obama contines to undermine police departments around the country"
As a response to the police shooting of Michael Brown, President Obama proposes $263 million for police training and body cameras. But more police training wouldn’t have prevented the Brown shooting and the president’s proposal plays into the hands of those who blame the police. Nevertheless, whatever Obama implies, there was absolutely no evidence Officer Darren Wilson was motivated by race and he did exactly what he should have done. Brown’s robbery of the convenience store, his decision to reach into the police car and punch Wilson while trying to take his gun, and finally Brown’s decision to charge Wilson was what caused the teen’s death. Under Missouri law, people can defend themselves with deadly force if they have a “reasonable belief” they need to use it to protect themselves against serious injury or death. Wilson claimed: “I felt that another of those punches in my face could knock me out or worse … I’ve already taken two to the face and I didn’t think I would, the third one could be fatal if he hit me right.” When Brown later charged Wilson, despite repeated warnings to stop, Wilson worried that he no choice but to shoot Brown. But we don’t have to take Wilson’s word for what happened. The forensic evidence is overwhelmingly consistent with his story. There is no doubt that Brown reached in Wilson’s car and hit him. Brown’s DNA was found on Wilson’s gun. Despite strong social pressure, three black witnesses confirmed Wilson’s testimony. Police officers in America have a more dangerous job than many people realize and they behave remarkably well under these circumstances. In 2013, the assault rate for the general public in the United States was 229 per 100,000 people. But the rate police were assaulted that year was 9,300 per 100,000 officers – a rate 41 times higher. The only reason that police don’t die at as high of a rate as people in other professions is because of their training and the fact that they are armed. . . . Aggravated assaults don’t necessarily involve injuries, just the attempt to cause serious bodily injury, but police are injured at a very high rate – 2,700 per 100,000 police officer. That is still much higher than the total assault data for civilians. . . .
Obamacare co-author says: "we muddled through and we got a system that is complex, convoluted, needs probably some corrections"
Sen. Tom Harkin, one of the co-authors of the Affordable Care Act, now thinks Democrats may have been better off not passing it at all and holding out for a better bill. The Iowa Democrat who chairs the Senate Health, Education, Labor and Pensions Committee, laments the complexity of legislation the Senate passed five years ago. He wonders in hindsight whether the law was made overly complicated to satisfy the political concerns of a few Democratic centrists who have since left Congress. “We had the power to do it in a way that would have simplified healthcare, made it more efficient and made it less costly and we didn’t do it,” Harkin told The Hill. “So I look back and say we should have either done it the correct way or not done anything at all. “What we did is we muddled through and we got a system that is complex, convoluted, needs probably some corrections and still rewards the insurance companies extensively,” he added. . . .
Obama's Freudian Slip that he is breaking law on immigration? : "I took action to change the law"
President Obama might be able to issue executive orders on a number of issues, but he doesn't have the power to unilaterally change laws. "Now, you’re absolutely right that there have been significant numbers of deportations. That’s true. But what you’re not paying attention to is the fact that I just took action to change the law. [Applause.] So that’s point number one." Media Matters' practices what I call hit-and-run journalism, where they make an attack and ignore any response that is provided. I have tried over about seven years to put up comments on their website responding to these claims (often quotes out of context or deliberately misread data). It appears to me that Media Matters wants to leave their readers with the impression that the other side never provides a response to their claims. Media Matters has removed all sorts of comments that I have placed on their website (indeed, I never kept count, but it is a lot), even ones that involve me explaining to people why my eyebrows are deformed because of surgery that I had as a kid. Here is one case recently where they made the mistake of removing my comments, but not the comments that responded to my original post. After Erik Wemple from the Washington Post contacted them about their removal of my comments, some recent ones reappeared. 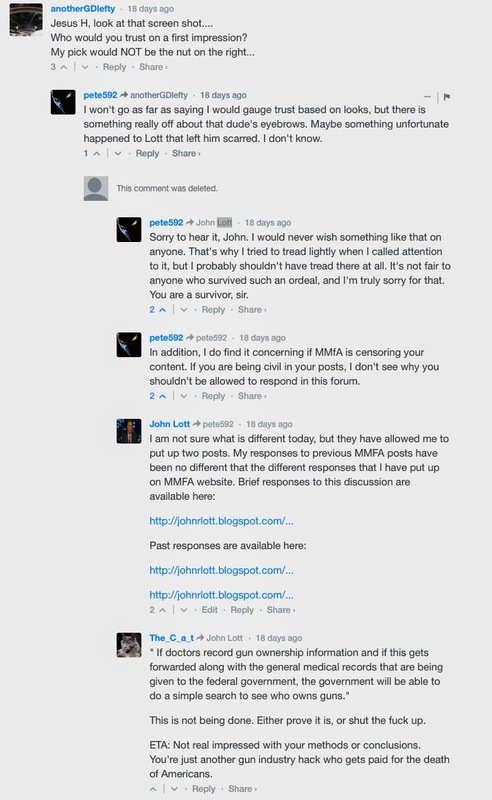 In this screen shot you can see Media Matters putting back the links to my response to one of their attacks (in this case see the second comment from the bottom). Media Matters apparently told Wemple that my comments were removed because their readers had tagged them as offensive. But Media Matters only very recently changed their system for putting up comments. Prior to that they would have to approve someone twelve times before their comments would automatically be posted on their website. The problem is that their screeners would virtually never let any of my comments through (surely not enough that I ever got close to the magic number of twelve). This problem over many years had absolutely nothing to do with their readers supposed complaints. In addition, Media Matters confirmed to Wemple that I had previously complained to them multiple times over the last seven years about them refusing to publish my comments. Here is one from mid-2013. Here are numerous other Tweets from 2013 and the beginning of 2014. I also have copies of emails that I sent them. Other exchanges about there unwillingness to post my comments were made in person and on the telephone. 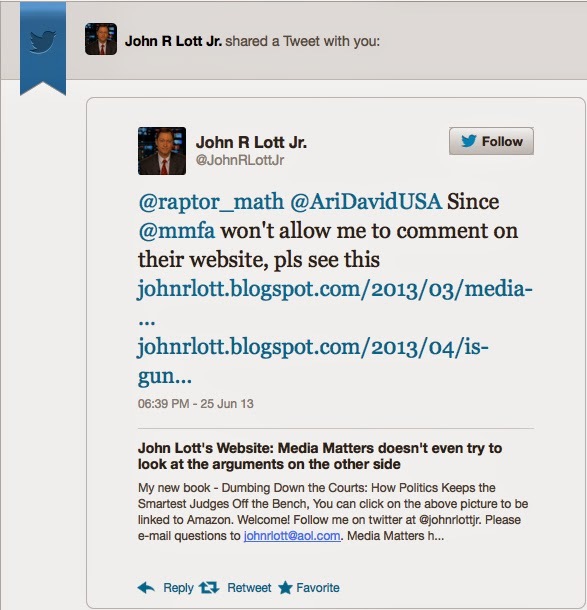 When Media Matters has attacked me, I would write up a response and post a link to the comment on their website. Here are 23 times that I wrote up and posted, though I haven't gone through everything that I have written and I am sure that there were more responses. Below I first show Media Matters' title and then a link to their claims and then my response. 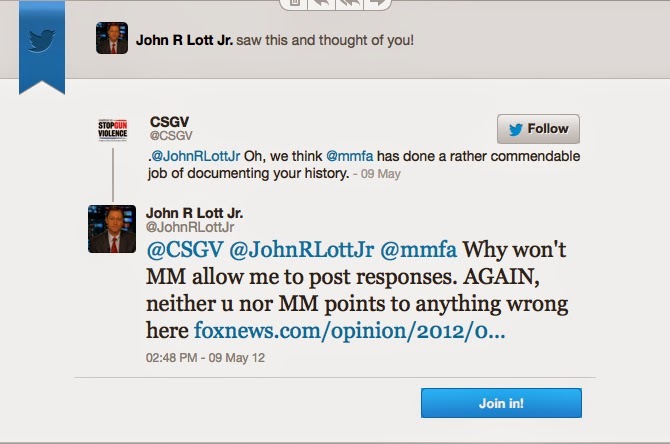 -- Who Is Gun Advocate John Lott? 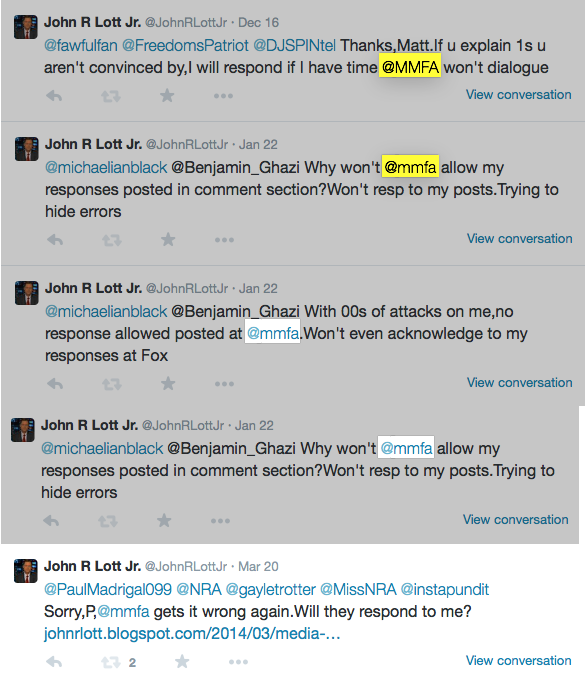 -- Why Is NY Times Citing Discredited Gun Researcher John Lott? My response and a Washington Post Fact Checker article available here. 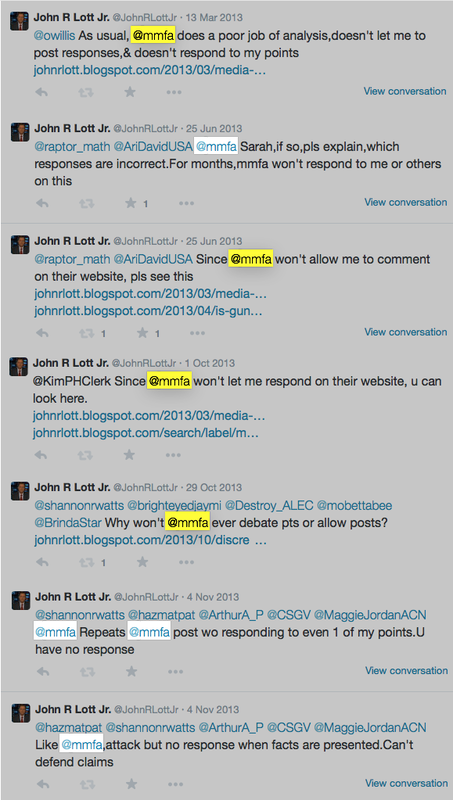 -- "Mother Jones and Media Matters bungle study on Mass Public Shootings"
-- "Napolitano And John Lott Advocate For Allowing People To Carry Concealed Guns Without Permits"
-- John Lott Continues Media Tour In Defense Of "Kill At Will"
"Media Matter's dishonest attacks on Fox News" -- discussion here. Media Matters has also done everything from doctoring pictures of me (see here) to . Here is a response that I didn't post on Media Matters website. Here is a response that I tried posting about seven weeks after I sent Erik Wemple the original story. 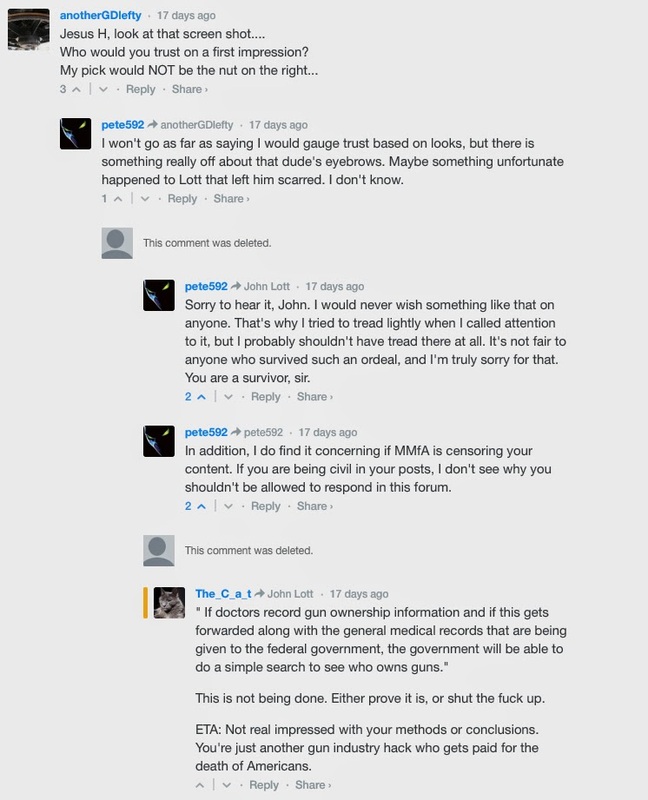 -- "Gun Researcher John Lott Relies On Falsehoods To Downplay Gun Violence Threat To Women"
Finally, let me point to a column that Ann Coulter has on this general topic, where she takes on the claims that keep on calling me "Discredited." See Ann's column available here. Newest piece in the New York Daily News: "Dangerous distortions about cops shooting black men: An oft-cited figure is based on incomplete data and questionable math"
Exaggerations have poisoned discussions about relations between blacks and the police. Harvard Law Professor Charles Ogletree echoed Todd. “The data is clear, that black boys are being killed by white police officers around the country.” The claim was repeated frequently on other shows. But those numbers aren’t entirely accurate, and they are far from the whole truth. There’s no denying that accidental deaths at the hands of police — like the killing of 12-year-old Tamir Rice, who was playing with a toy gun in a public park — are horrible tragedies. But at least part of this feeling seems to stem from how the media covers the issue. If their claim is right — if police do unjustly shoot blacks at vastly higher rates — it is a serious indictment of the police. But, fortunately, these allegations are false. One allegation is that 15-to-19-year-old black males die at the hands of the police 21 times as often as do white males of the same age. Another claim is that blacks commit violent crimes no more than two to three times as often as whites do. By combining these two claims, some journalists conclude that police still kill young blacks at least seven to 10.5 times as often as they kill young whites. But they don't make it clear that literally only a couple hundred police departments (217 in 2012, just 1.2% of all the departments in the country) report these numbers. Even worse, the very few police departments that do report are predominately urban areas, which tend to have much higher concentrations of blacks. This skews the numbers to over-represent black deaths. . . . .
How reticent are police in using "justifiable" force to kill criminals? In 2011, there were 399 reported justifiable homicides by police. There are real problems with the justifiable homicide numbers as few police departments report these numbers. But they can still serve as a proxy for measuring how frequently police resort to deadly force when they are threatened. In 2011, the FBI has data on the number of police officers who are assaulted (54,774) or assaulted with injuries (14,578). Of course, police may use justifiable force to kill criminals without being assaulted, such as when a criminal is threatening to shot them, and we don't know how many of these cases there are. But take these numbers as being correct. These numbers imply that only about 0.72 percent of assaults and 2.737 percent of assaults that injured police end in justifiable homicides by police. To the extent that the FBI's count of justifiable homicides by police underestimates the true number, the true percentages are higher. Suppose that justifiable homicides by police is three times higher than reported, that would imply that about 2.16 percent of assaults ended in justifiable homicides by police. For assaults where police were injured, about 8.2 percent of those cases would end in these justifiable homicides. People can adjust these numbers as they think best. The problem with FBI justifiable homicides by police is no where near as bad as the numbers for justifiable homicides by civilians, but we don't really even know the size of the errors here. To the extent that this measure of assaults doesn't include all cases where police might feel threatened, these percentages are too high. For a second I thought that these statements might have been made as a joke, but it is pretty clear that it wasn't a joke, particularly after he noted that they would be protected by the Democratic district attorney. A Louisiana mayor whose son is Democratic Sen. Mary Landrieu's chief of staff told voters at a private event to vote twice, speaking to a partisan crowd 24 hours before Election Day last month.Video of Opelousas, Louisiana Mayor Don Cravins Sr.'s Nov. 3 remarks show him telling a crowd in his home town that 'if you "early voted," go vote again tomorrow. One more time’s not going to hurt. 'Louisianans, like Americans in many states, had the option of either voting 'early' or showing up on Election Day. Taking advantage of both options would be a crime.And for voters worried about criminal fraud charges, Cravins said he had an insurance policy – the re-election of a Democratic district attorney. . . .
. . . Barber’s campaign is challenging 133 ballots it says were wrongly rejected because voters went to the wrong polling site. State law says that if you vote at the wrong site, your ballot will not be counted. But Barber’s campaign says every vote should count – and blames the problem on poll workers who neglected to tell voters they were at the wrong site. Last week, the Pima County Recorder’s office said 240 votes were rejected in the CD2 race because people voted at the wrong place. So why isn’t Barber’s campaign insisting all 240 be counted? I asked Rodd McLeod, who works with Barber’s campaign, that last week. Later in the conversation he said, “It wouldn’t shock me if they were mostly Democrats, obviously.” . . . .
Ron Barber’s campaign wants to count votes that will go his way and they do not want to count votes that will not go his way. That’s why we have a battle over 133 ballots in court and not 240. I can’t blame the campaign for making every effort for their candidate, but I resent them wrapping themselves in the flag and telling us “every vote must count” when they really don’t believe that at all. . . .